Lefkas is a Greek Island that never used to be an island. Way back in 800 BC, the Corinthians managed to dig a canal through some marshlands to create the island. Later on the more modern-day Greeks had installed a swing bridge so you can drive from Lefkas to the mainland. And that’s what we did at 6am, heading for the Meteoras. Ever since I got to Greece with Dee, she’s been raving on about the Meteoras. So now it was time to see what all the fuss was about. The drive up there was pretty cool. It took us 3 hours to wind our way up through the mountains with numerous tunnels and viaducts, all built with lots of EU money. At one stage we hit fog as we drove through the clouds. The drive itself was worth the price of admission. We arrived at the town of Kalambaka, just after 9am and found the tourist office who gave us a really good map. Then we were off. There’s six monasteries you can visit and we did them all. Theres quite a few others dotted around that airen’t open to the public and those that are open are closed on different days so we jagged it arriving on a Sunday when all 6 were open. The monasteries sit perched on top of rock columns and in the olden days the only way the monks could get in and out was by a series of ladders and rope baskets. 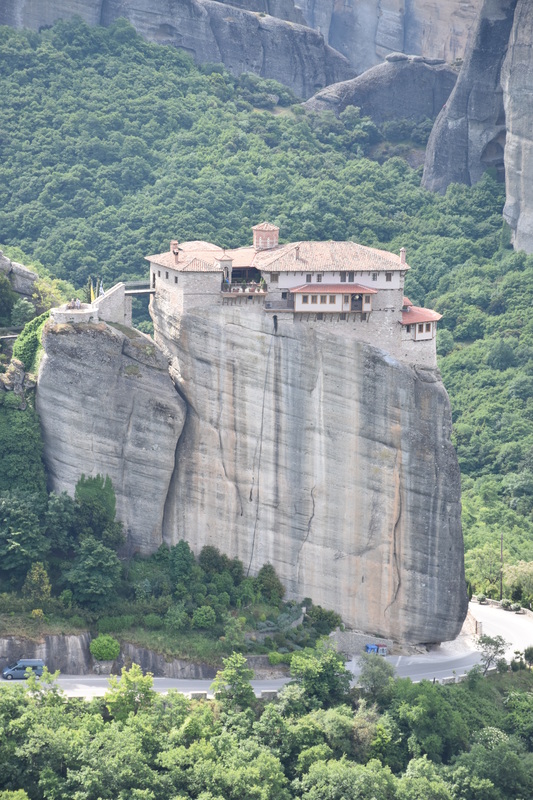 Begs the questions as to how exactly did they manage to build the impressive building perched on top of sheer rock cliffs in the first place. Nowadays they have carved steps into the rock face and put in a modern road that goes round the back of each of the six monasteries. There are also flying foxes that winch across supplies. Each of the monasteries are a bit different, all retaining their air of myth and mystery. For starters, one is a nunnery – evoking images of Monty Python and the Holy Grail. The most famous is the one that was in James Bond’s “For Your Eyes Only”. Must watch that movie again. This is the most photogenic but the least interesting inside. Megalo Meteoro is the most extensive, housing several museums, including the blacksmith’s shop and the extensive kitchen. As you wander around, you catch a glimpse of monks and nuns going about the stuff that monks and nuns do. We managed to knock off all the 6 monasteries by 1pm and we then headed off to find a nice restaurant in the cute little village of Kastraki for lunch. Kastraki sits spectacularly right at the foot of the Meteoras and it was filled with rock climbers, one of which only had one arm. Now there’s guts. The adrenalin junkies are well catered for here as there is also an annual mountain bike race down through the Meteoras. 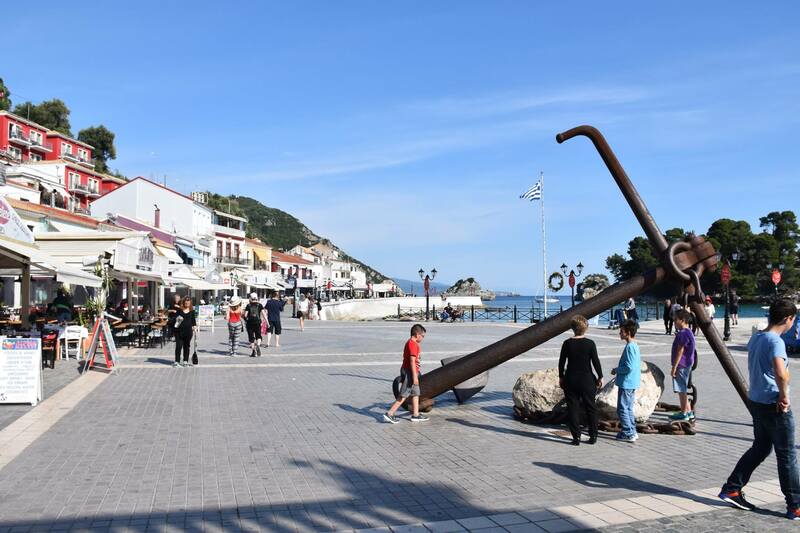 We still had some time up our sleeve so we headed for Parga, which is a charming little resort town on the neck of a promontory flanking two bays, with an impressive Venetian Fortress perched high on an adjacent headland guarding the whole town. We spend a couple of hours there checking out the old town, the nice beach and the views from the fortress. Then it was off back to Lefkas. This entry was posted in Greece and tagged Kalambaka, Kastraki, Meteora, Parga by stull61. Bookmark the permalink.